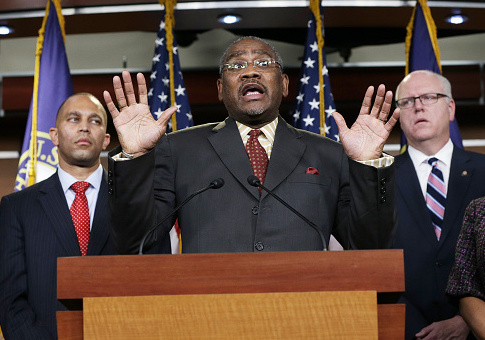 Democratic Rep. Gregory Meeks (N.Y.) has paid a company that is owned by his chief of staff's wife nearly $200,000 from his campaign funds, Federal Election Commission filings show. Meeks, who was first elected to Congress in 1998, has employed Robert Simmons out of his Jamaica, New York City, office since 2003. Simmons began working with Meeks as a part-time aide before becoming his New York chief of staff in 2008, according to Legistorm. Patsy Simmons, Robert's wife, also works for Rep. Meeks. Patsy is listed as the treasurer of Friends for Gregory Meeks, the congressman's campaign committee. Patsy is not paid directly from Meeks' committee to act as its treasurer, which is typically an unpaid position. Payments are instead made to Einna, Inc., a company that was registered by Patsy in November 2008, according to New York business records. The payment scheme, which was first reported by the New York Post in 2010, has proven to be lucrative for his top aide's wife. Rep. Meeks's political action committee, the Build America PAC, has also disbursed tens of thousands to Patsy's company over the span of nine years on top of what the campaign has paid during this time. Einna first appeared on Meeks' campaign payroll in 2008—just two years after Simmons had become Meeks's New York chief of staff. The company was paid $66,300 from Meeks's campaign committee between 2008 and 2012. During the 2014 election cycle, Einna was given $33,800 from the campaign while the Build America PAC added $7,000 worth of payments throughout the cycle. Meeks' campaign then cut $57,000 worth of payments to Einna throughout the 2016 election cycle. The Build America PAC added $17,000 during this time. Einna has received two payments totaling $15,000 from Rep. Meeks' campaign this election cycle to date for "administrative consulting services." The Build America PAC has been given an additional $4,000, campaign finance records show. Einna has now received $196,100 worth of payments from Meeks's campaign committee and political action committee. Meeks came under fire earlier this year for reporting a phantom address for both his campaign committees and PAC. The Observer reported in May that Meeks's two campaign committees, Friends for Gregory Meeks and Meeks for Congress, both reported their headquarters at an address that does not exist. The Build America PAC also listed the fake address as its office space. The publication visited the office building and found that the campaign committees and PAC were located in the same suite that serves as Meeks's taxpayer-financed New York congressional office, where Robert Simmons works. Meeks's campaign did not return a request for comment on the payments by press time. This entry was posted in Politics and tagged Gregory Meeks. Bookmark the permalink.